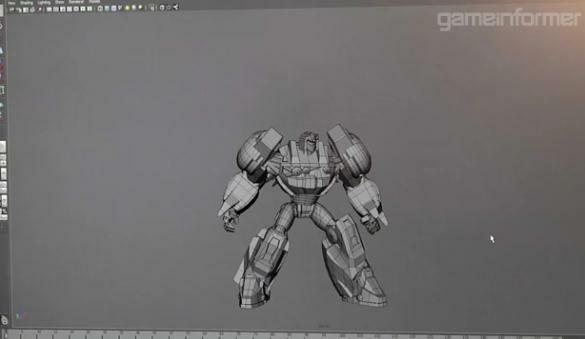 Thanks to GameInformer, there is more behind the scenes video from High Moon Studios as they work on Transformers: Fall of Cybertron. The "spirtual successor" to Transformers: War for Cybertron is scheduled for release in Fall of 2012 as it tells the story of the exodus from the dying planet. 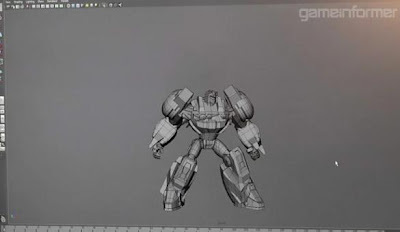 The four videos show the work involved in creating the transformation sequences for Optimus, Jazz, and Grimlock while Jason Diaz, lead animator on FoC, explains the goals and the challenges faced in creating the animation. Click here to view. For Grimlock fans, the third video gives you a Maya black and gray look at his robot mode and transformation sequence to dinosaur. - Transformation sequence biggest challenge for animators with a magician's trick used to pull off the "swap" between robot and vehicle mode. - Optimus Prime transformation involves a ground pound that lifts him off ground for air needed for vehicle mode. - In animation to robot mode, tries to get gun arm into shooting position as quickly as possible, even before transformation completes. - Jazz's transformation sequences essentially have him do a dance move into each mode. - Jazz is comprised of around 50 separate parts that can be moved around to suit animation needs. - Grimlock none vehicle alt mode and over size and mass made him one of the more difficult transformation sequences to create. - Grimlock does his own ground pound to start his sequence to dinosaur that finishes with a roar. - Using the cartoon animators classic tool of a mirror (see almost any Disney behind the scenes animation featurette) to view their own expressions to help create the character expressions. Some more articles are up showing 3 of the Dinobots, Wheeljack's alt mode, and AI characters.